What came out at the end was one of the most surprising comedies of the season: surprising, first, in how competently directed and paced it was; surprising that it remained funny and engaging despite its shallow characterization; surprising in that, if one cares to look, there is actually some sly social commentary lurking beneath the gags. One of the things that struck me years ago when I was watching Kare Kano was how, alongside the usual good looks and athletic ability, one of the things that made both Arima and Yukino popular was that they were great students. The fact that they scored near or at the top of their class in test scores was worthy of awe and admiration, with students flocking to them eagerly for assistance. 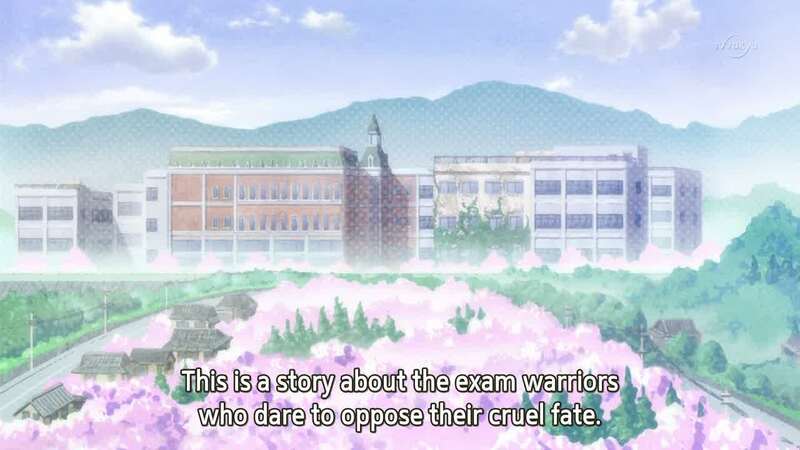 Who knows how prevalent this is in Japanese schools today, but it struck me and my other high school classmates as being a situation that we could not imagine happening nearly as much in America. Academic ability by itself seemed to be not nearly as respected for its own sake. Our culture seemed a much more jock culture by comparison. BakaTest is about the flip side of this, the academic losers: who are considered losers not just in studies but socially and even economically, period. The grade of equipment is a visible reminder of this caste system, and considering that their avatars’ abilities are based on test scores, the academic/social hierarchy gets reinforced with every battle. Like a lot of Asian educational systems, scores are everything, and they take no account of such things as illness or other extraneous circumstances: hence the otherwise book-smart Himeji’s placement into Class F. Not too far into the show, I recognized that all this was a playful, exaggerated parody of Japanese schooling’s obsession with test scores and the social sorting that happens as a result of them. The ED song’s anthemic, “Idiot Pride” lyrics make a lot of sense in that context. This is about people who may not get the greatest scores (or do, but are only in the wrong place by accident), but are likable and admirable in different ways–despite the pressure from more capable peers, teachers, and even incestuous older sisters played by a saucy Kikuko Inoue. The problem is that these characters, in the manner of a sitcom, never change. The final episode simply restores the status quo. One can have a comedy and character growth–Seto no Hanayome proved that–but, given that a second season is forthcoming, perhaps the writers have decided to save those moments for later. 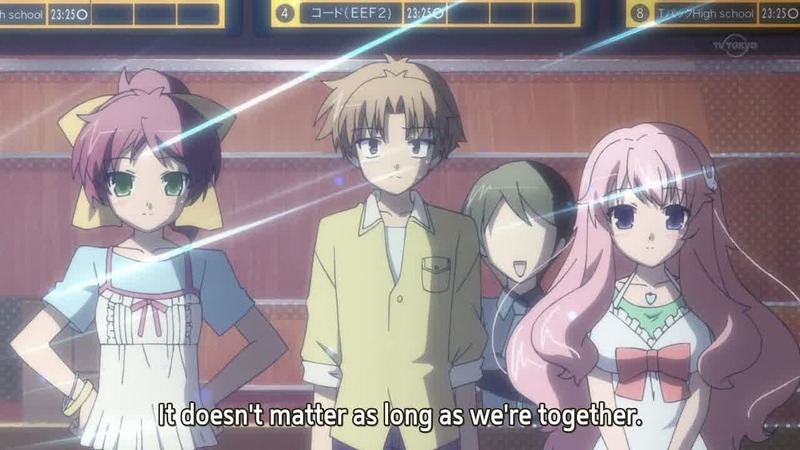 Still, that meant that the show’s success had to rest on something other than interesting characters or a fascinating plot: rather, the quality of the gag determined whether an episode worked or not.The idea of Yuji and Shouko being forced into a mock wedding by all of their friends, for instance, escalated brilliantly and even led to a small character-building moment by the end. Arguably, the biggest gag of all was actually a character: namely, Hideyoshi, the most successful trap to hit the otaku blogosphere in recent memory. In some ways he is the emblem of the show: the trap is now a well-worn anime archetype, but like many things the show subverts it by making him masculine in identity, speech, and mannerisms…except the trapness is literally forced upon him by the animators who make him look and dress feminine. In one episode, one moment he is dressed in the normal boy’s uniform; the next, with no explanation, he appears in a fetching qipao dress. Later it is revealed that “he” is a gender unto himself, with separate dressing rooms. Such moments are what memes and hilariously disturbing blog posts are made of…and the producers played on them masterfully. 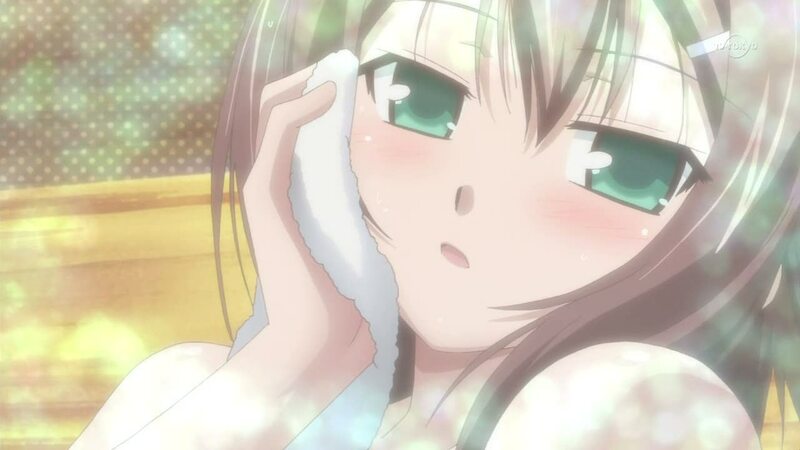 The show will probably be remembered most for Hideyoshi. The fact that it is Shin Oonuma directing, and in an instantly recognizable style, leads one to think that this is just another SHAFT production. Except, of course, it isn’t; it’s with a studio called Silver Link, one I had not heard of prior to this show and have in the past mainly done in-between work for other studios. In ef and in Shinbo productions, the abstraction, the color scheme, and other aspects are a lot more “in your face” than they are here; the tack Oonuma uses is to employ a variety of visual types for comedy. 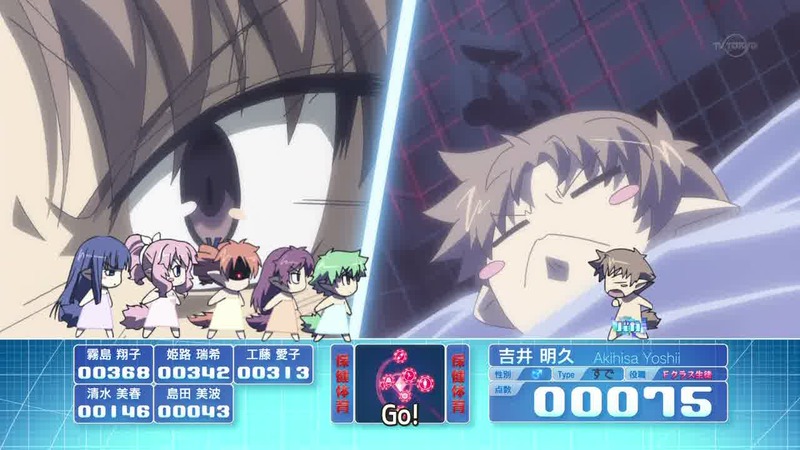 It could be an interior monologue with text running on the bottom of the screen, sudden character design shifts (especially to GAR–or bishounen–looks), or even Hideaki Anno homages, but instead of doing “arty things for artyness’ sake” the techniques are mostly to get a laugh. The comedy is in the disjunction, which I’ve noted is the hallmark of Shinbo and SHAFT’s productions and is being carried forward in an even more bizarre way in Arakawa Under the Bridge. Here, otaku tropes are what are in play, so much of the comedy takes expected forms–and yet are shuffled and remixed in ways that still somehow remain fresh and funny. “Remix” is perhaps a good word to talk about the show as a whole, actually, from its patched-up visuals to its character types and gags that blend together into something new(ish). At the end of the day, BakaTest wins in part because of low expectations–a director this talented makes something worthwhile out of formula elements–and because it’s actually pretty funny. Undoubtedly reviews like these tend to drain the comedy out of everything, so the best thing to do, really, is to go watch it again and bask in the cheesy otaku laugh fest. It’s fun, and that’s all it really needs to be. Nice piece on what I would consider my favorite show of last season! 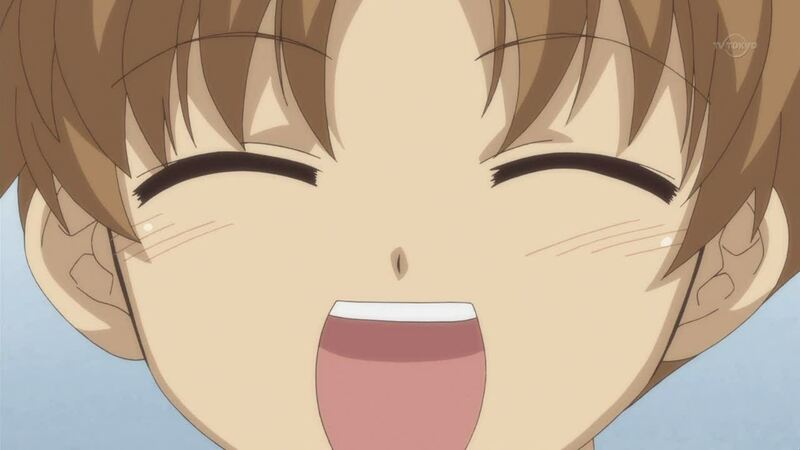 And as for my comment, I really just want to bring up one point that you mentioned: Hideyoshi. I will certainly remember Hideyoshi the most out of all the plot point and characters. Oh, yes: and the End of Evangelion bit in one of the later episodes had me rofl’ing dramatically. It sounds awesome and the BL Suff sounds funny!